I had a get-together to attend this weekend and wanted to bring something. I scoured my extensive Pinterest boards and finally settled on attempting these projects in combination. Assembling the ingredients was pretty basic for a cookie dough; no surprises there. Although, it would have gone much smoother if I actually had a paddle attachment and an actually Kitchen-Aid mixer. 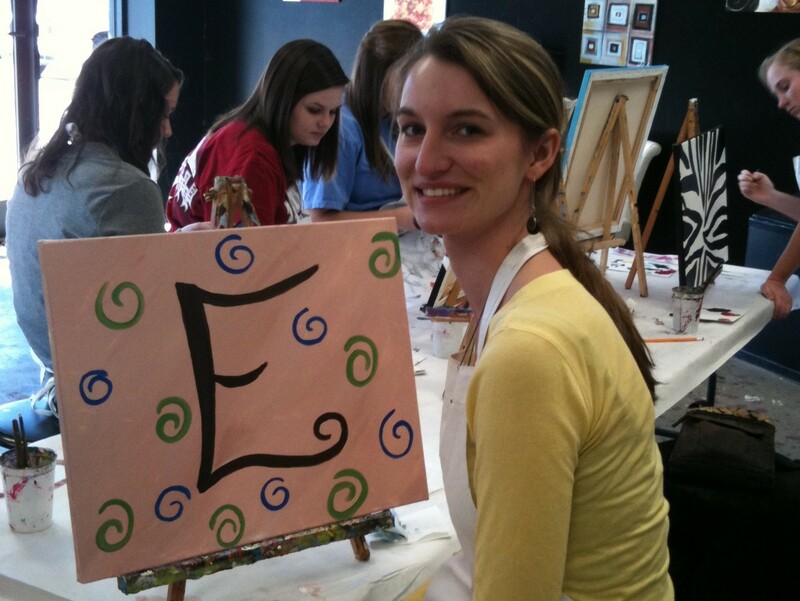 (If Kitchen-Aid would like to sponsor me in return for some good blogging, I wouldn’t object!) For some reason my little Sunbeam just isn’t up to the task of mixing dough and I ended up transferring the wet ingredients into a bigger bowl to blend with the dry. Overall though, I was surprised how easy it did blend together, even with my sad equipment. Getting it onto the plastic wrap to refrigerate was fun since this is by far the STICKIEST DOUGH I have EVER worked with, but wasn’t too difficult. I managed, and chilled it over night. Then came the fun part: rolling, cutting, baking! As mentioned before, this is THE STICKIEST DOUGH I’ve EVER worked with, so it required a LOT of flour and a second attempt at rolling it out. Luckily, the recipe called for cutting the dough in half , so I just balled that puppy back up, popped it in the fridge, and pulled out the other nicely chilled batch. 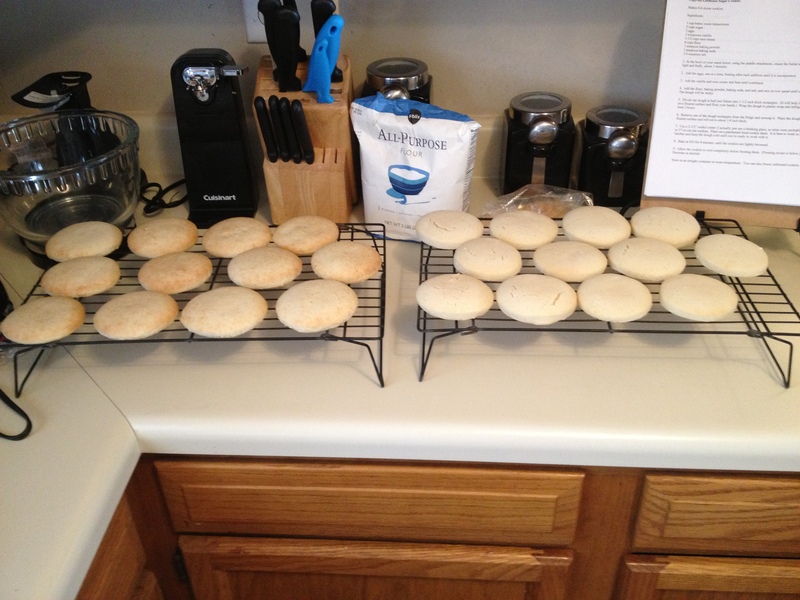 The problem I ran into with the first attempt was I used my counter top and apparently did not flour it enough. I made it all the way to cutting the cookies, but when I went to transfer them to the cookie sheet, they would not come off the counter. I ended up having to use my scrapper for cleaning baking stones to get it all back together. (No pictures of that, sorry). 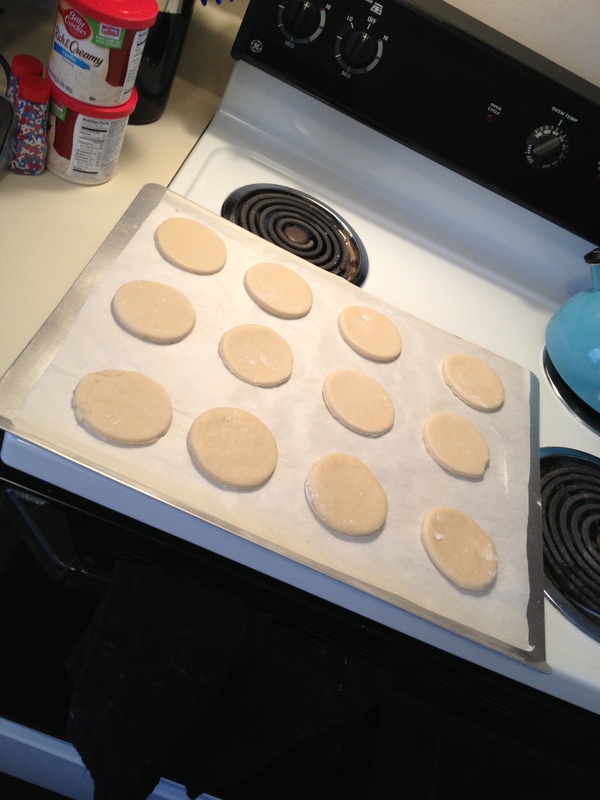 Anyway, on the second attempt I used parchment paper and LOTS of flour, so I had no issues. I ended up using a drinking glass to get nice, big cookies (as recommended in the blog). For the most part, it worked great. But I did end up spraying the rim of the glass with baking spray to keep it from sticking and had to clean it off quiet a bit to keep the cuts nice and smooth. 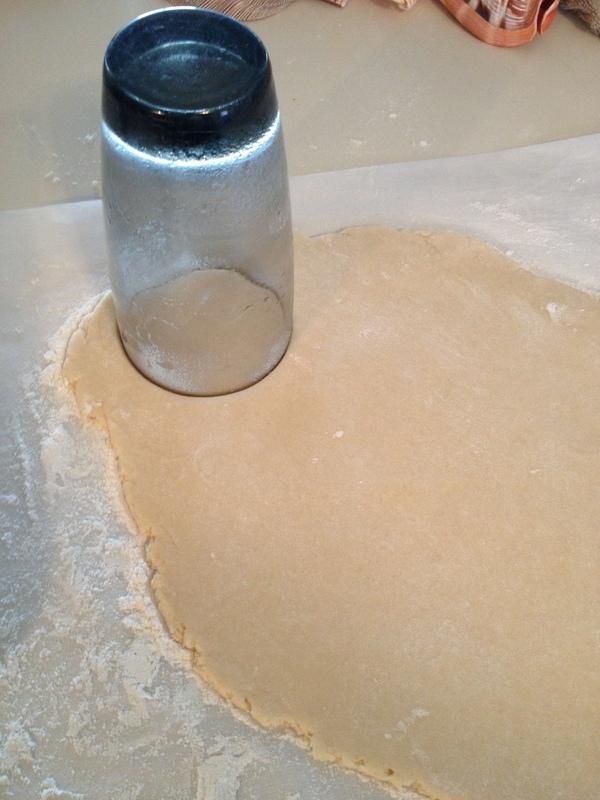 This got easier the faster I was able to work with the dough. 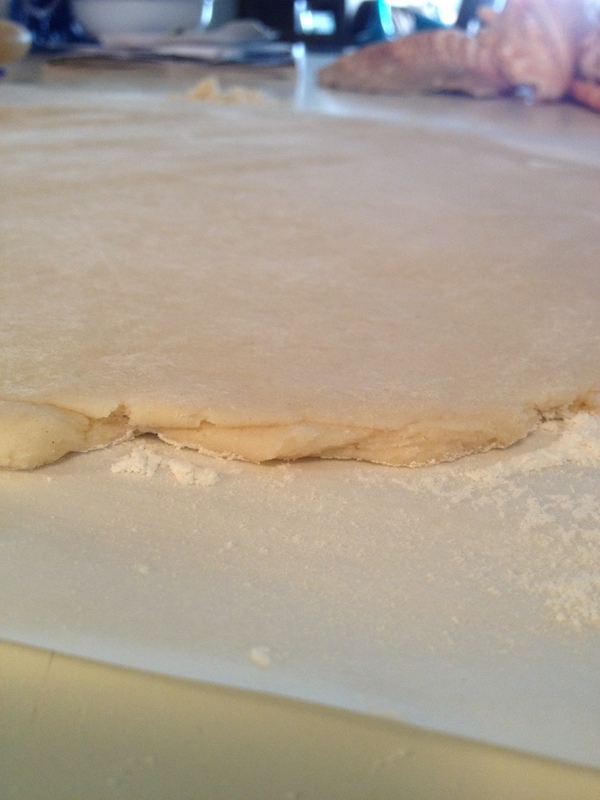 The longer the dough was out, the more it returned to a sticky mess. The morale here: work with it quickly and efficiently to avoid stickiness. So Friday when I bought all the supplies was a pretty bad day and I didn’t feel like fighting with my sad mixer for dough AND frosting, so I opted for store bought. Then came the hunt for Pop Rocks. I was pretty sure that I could find them at The Dollar Tree, but after about 20 minutes of searching the one candy aisle, I was about to settle on a knock-off super hero version of “popping candy.” Then thankfully I noticed something in one of the bins… What’s this? It says Pop-Rocks? Ah, it’s masquerading in it’s retro 1970 packaging…. Thank you original Pop-Rocks for adding to my long day… But I had them! And now the big moment: Do they live up to their namesake? The answer: heck yes! 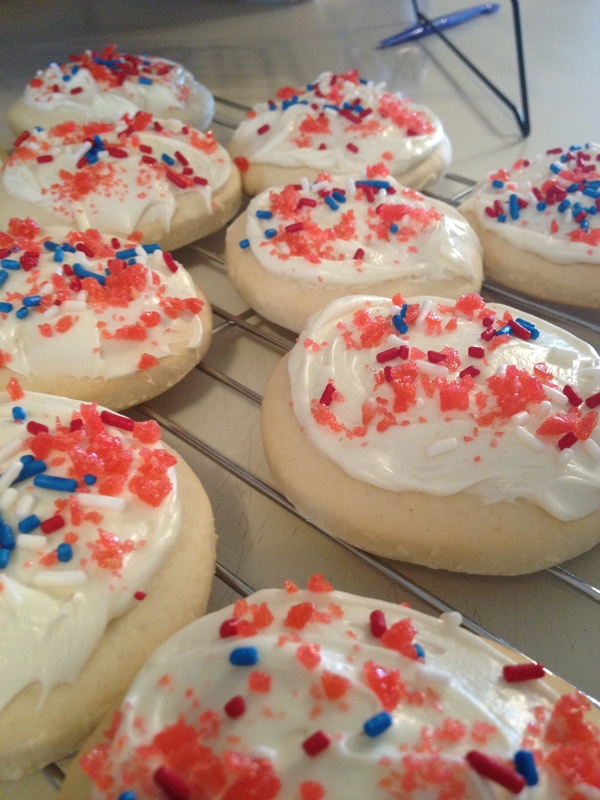 They were fabulous and just like a Lofthouse cookie. Then to top it off, the compliment I got over and over again was that they weren’t too sweet, although I think that was due to the store-bought icing. The only disappointment was the Pop-Rock topping. 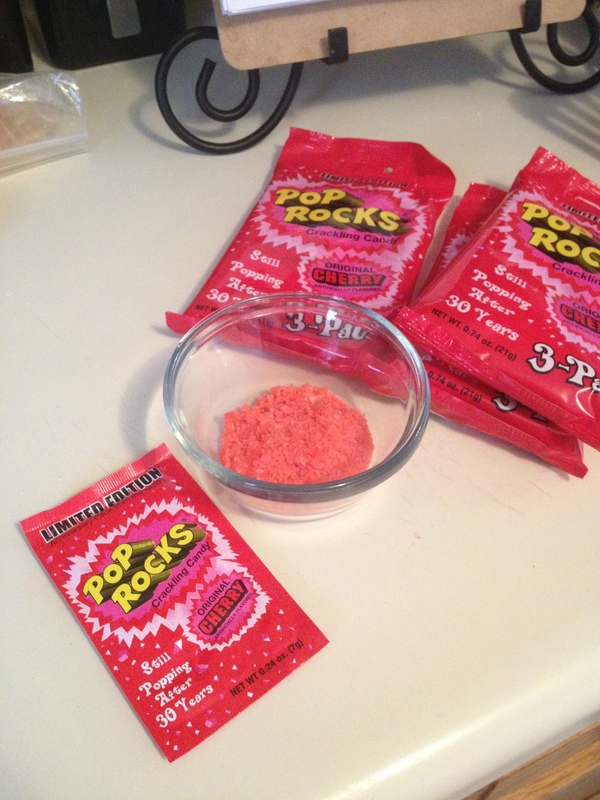 After first making them, the Pop-Rocks were kind of fun. They added a little pop, but not much. 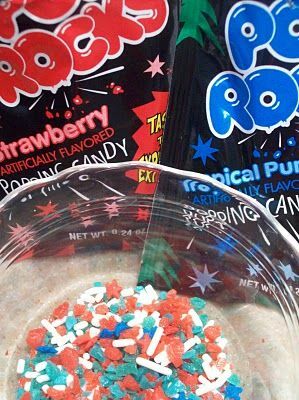 Also, I had some concerns about the Pop-Rocks being cherry flavored, but I couldn’t taste that at all. 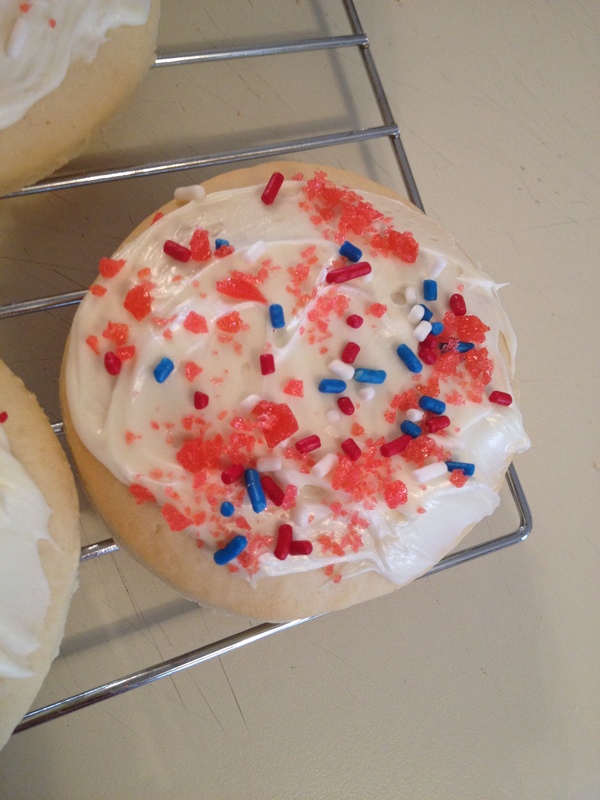 But the major downside was Pop-Rocks on icing don’t keep! 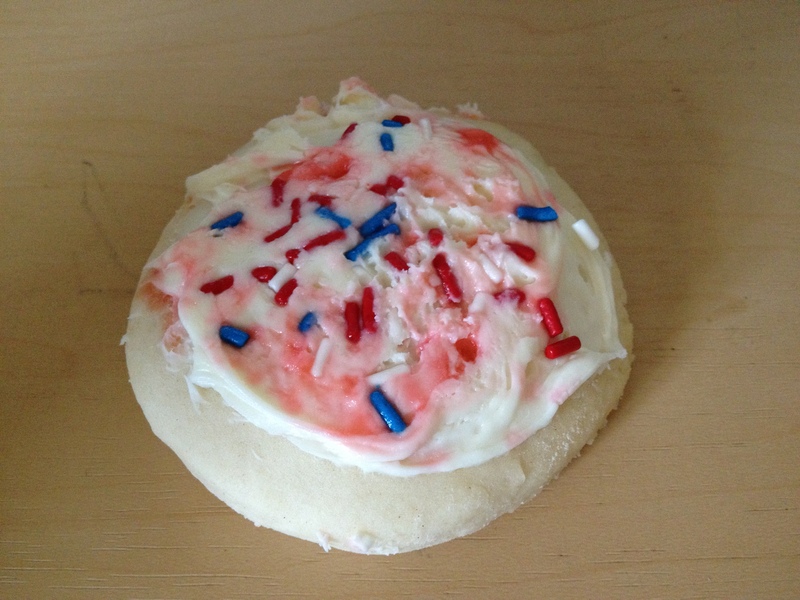 I decorated the cookies a couple hour before the party, and after putting them in a covered container, the Pop-Rocks ended up with a melted look. The batch I left out on the counter (open-air) didn’t “melt” so much, but certainly lost their power. 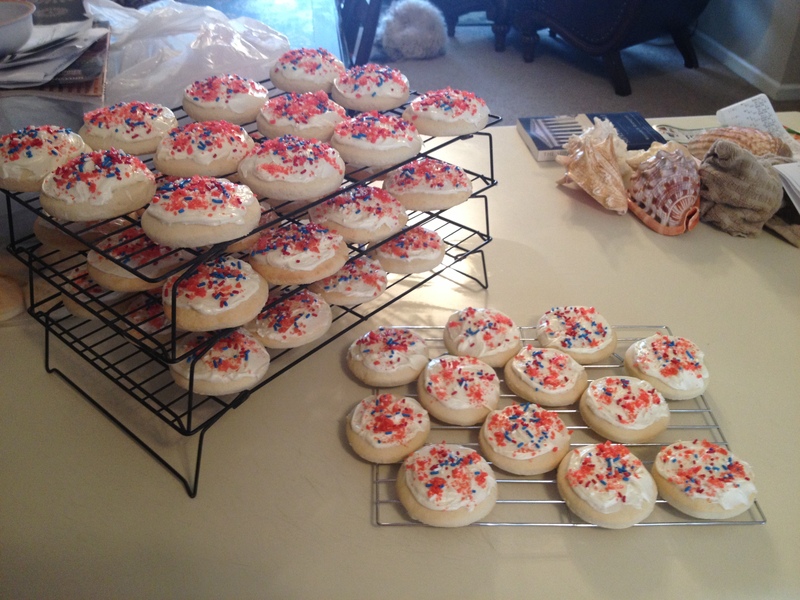 The result: no one knew there were Pop-Rocks on the cookies 😦 Oh well. Oh, and here’s what I’ve ended up with after 2 days in a sealed container. The icing feels just like it did coming out of the container. These are certainly cookies that need to breathe. But the good thing is leaving them out doesn’t dry out the cookies. The cookie recipe lived up to it’s name, but the process was a little involved. But if you’ve worked with rolling out and cutting cookies before, you’ll have no problem. Flour, flour, and more flour! Protect anything that touches the dough! 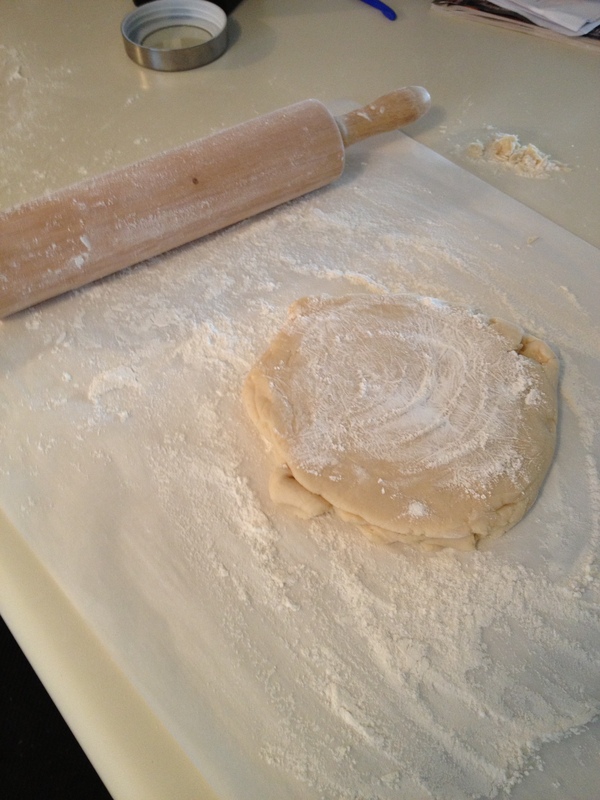 The more efficient you are with a rolling pin and cookie cutter, the less time you’ll spend in sticky dough. Do not overcook them or you’ll loose the Lofthouse texture. 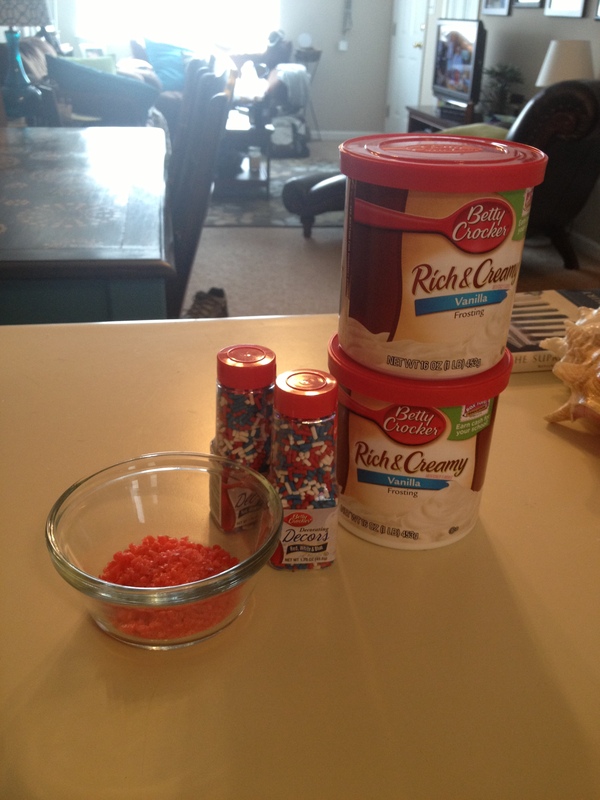 If decorating with Pop-Rocks, add them shortly before serving. Your turn! This really was a fun cooking adventure.